The Philippines got it's first golden buzzer in the reality show "Asia's Got Talent" courtesy of Pilipinas Got Talent grand finalist El Gamma Penumbra. The shadow theater group from Batangas City was the sentimental choice (this blogger’s choice, too!) to win Pilipinas Got Talent season 3 because of their emotional and inspiring performance during the grand finals of the said Kapamilya show. However, people’s votes prevailed and the title went to Southern Leyte’s Maasinhon Trio. Khalil Ramos won 2nd place that time while Bringas Brothers were named third placer. 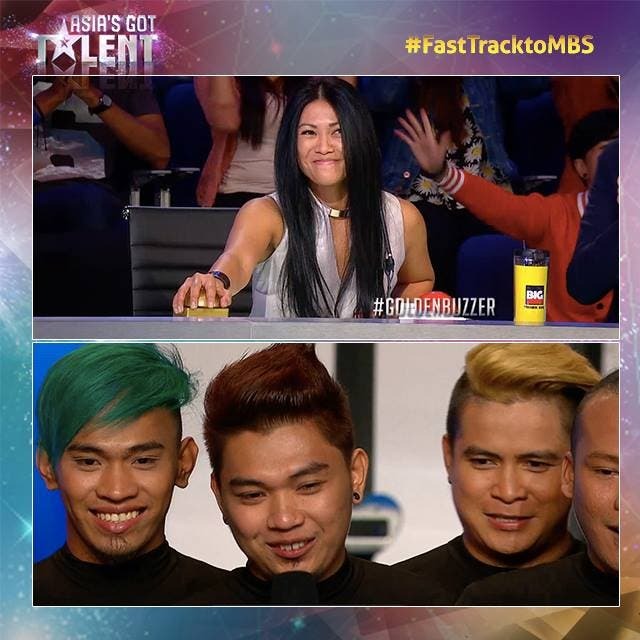 The group is now vindicated because they became the first act from the Philippines to received a golden buzzer in Asia’s Got Talent which means they will fast-track to the semi-finals of the show to be held at Marina Bay Sands in Singapore this May. Indonesian diva Anggun, the fourth judge, hit the golden buzzer which means the group is going straight to the competition’s semi-finals which will be held at the Marina Bay Sands in Singapore this May. Aside from El Gamma Penumbra, 10 Philippine acts are going to the call backs so far, the most by any Asian country. Yes grabe ka mangha-mangha ang pina kita nilang galing, sana maka pasok sila sa final at si Lord na ang bahala sa final.